After regretting (on the original buggy sign post) that we had no Allen County, Indiana sign, reader Torey has kindly shared this photo, taken near the town of Grabill. 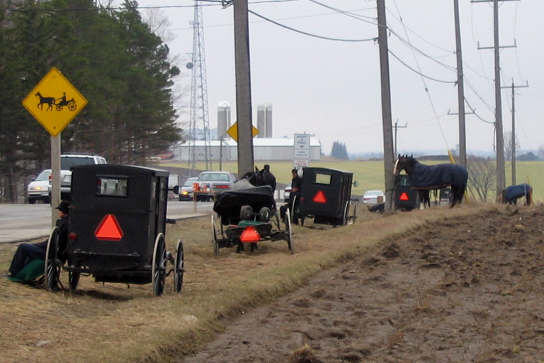 You may be aware that Amish in Allen County are considered “Swiss Amish”. Swiss Amish differ in a few ways from most other Amish (most Amish are considered to be of “Pennsylvania German” ethnicity). Swiss Amish speak a different German dialect, have different last names, and only permit open-top carriages. The Allen County sign is one of the few I’ve seen to depict an open carriage. I like it because I’ve always found it a pretty funny image. It looks like a plank of wood floating over some wheels, with a driver sitting on top of an upturned bucket (or something). Allen County carriages are typically a bit more elaborate than that, but come to think of it, not a bad rendition. Also, this is the only sign I know of where the buggy is traveling from left to right rather than right to left. A clever commentary on conservative Swiss Amish culture? Not sure the artist had that in mind, but it’s fun to think. 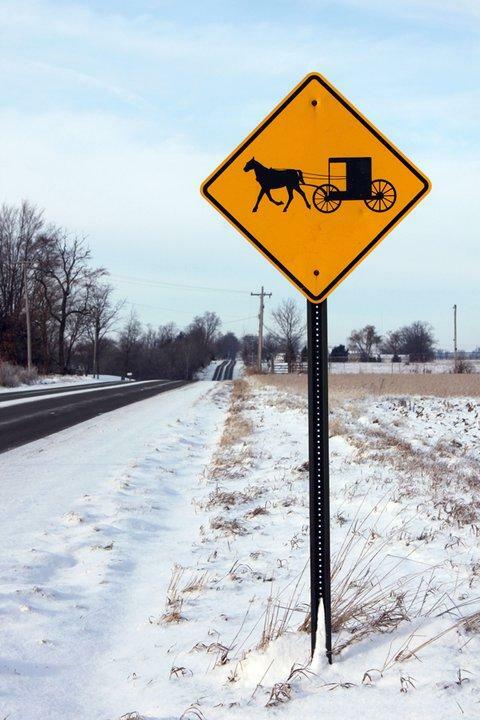 I also came across another open-top buggy sign, from a Mennonite area of Ontario. However, as you can see by the photo, some of these Old Order Mennonite carriages do in fact have tops. By the way these are not the victims of mass buggy breakdown; they are apparently selling maple syrup. Looks cold guys, hope you sold a bunch. Finally, Keith James shares the photo above, taken in the snow-covered St. Joseph County, Michigan Amish community. Amish have lived in Michigan for 100+ years. The St. Joseph County community, located near the town of Centreville, is Michigan’s oldest and largest. The community has ties to the Elkhart/Lagrange County settlement just over the border in Indiana. You’ll find more about those connections at the link above. 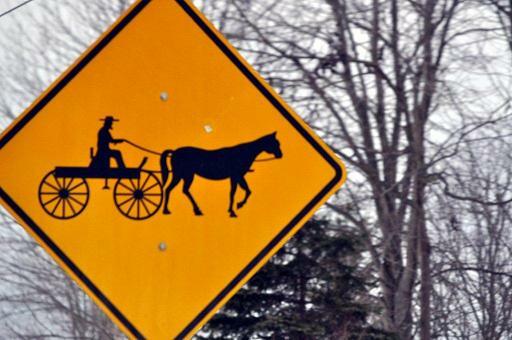 UPDATE: Brad Igou of Amish Country News just shared the non-Amish buggy sign below, taken in Bird-in-Hand, PA. I believe it may be unique. It also, seemingly, has disappeared. I don’t know if it was stolen or taken down for other reasons, but luckily I got a picture of it. It was located just before the Hand-in-Hand Fire Company in Bird-in-Hand, PA. Interestingly, just this week on the way to work, there was a fire alert to the volunteers, and I saw several Amish men on their way to the fire company on their scooters. That’s all part of what makes living in Lancaster so special… the volunteerism, unusual sights, and those great fire company dinners! Still no St. Mary’s County, MD and Lancaster/Lebanon Counties, PA … I’d contribute pictures but don’t live near either any more. So interesting about the differences from area to area, yet they are all fundamentally the same. hmmmmm… I wish I could pick up some of that maple syrup today! I just came back from Gorham, New York where I spent several hours talking with an Old Order Mennonite lady and her husband that live there and are friends of mine. Out where they are there are NO buggy signs. She said that there have been some very serious accidents where cars have hit buggies out there, which brought up how I almost hit them once. She and her husband, as do the other Mennonite in her area, agree signs should be out there, but they never put them up. They also worry about their children and make them play in the back yard and not the front. Is that in Canada or in Elmira, New York. As I live in New York State if it is in Elmira, NY I would like to go. If it is in Canada where is Elmira near. Umm, Marilyn,,, the picture is of the “mennonites/amish in ontario” that would mean the Elmira Maple Syrup Festival is in Ontario Canada. We have an Elmira, New York-I hoped it was there. Now I wonder where Elmira is in Ontario. I guess I didn’t read it right. We are really getting the snow this evening. It was cloudy when I was in Gorham today, but it didn’t start snowing until I was on my way home. Yes I know there is an Elmira, NY,,,, I am from NY state originally. Try googling Elmira, Ontario and yo should get a map to look at. We are suppose to get more snow tomorrow and Monday then be clear the rest of the week. I sure hope so, we have a lot of appointments coming up this week. I never thought of that. I am kind of thick sometime. We are snowing now and are suppose to on and off all week. We are 28 inches over what we are suppose to snow each year. I hope you can get to your appointments. I have one to the foot doctor on Friday-I hope I can make it. I can hardly wait until Spring. Oh, I wrote you on Amish Stories, to. I love that Amish Scooter sign from Lancaster County. There is one Lancaster Amish Scooter down here in Pinecraft right now. I am still waiting to get him on the camera. Katie … I completely missed the Lancaster scooter sign … it’s really cute but they say it disappeared! Probably some crazy tourist collecting a “souvenier” … I love seeing the children riding those scooters. On our last trip, we arrived in Lancaster Co. around the time school was getting out and the children were on their way home … lots of scooter “action” … 🙂 … are your Lancaster visitors still in Pinecraft? I’m always struck by how many shared names there are between the United States and Canada. I have noticed that sometimes Amish Mennonite settlements sometimes by coincidence crop up in or near communities with the same name. Having read AA for sometime now, I’ve discovered there is an Alymer in the USA and I know there is one near Lake Erie in Ontario, because I’ve been to the northerly one and seen OO types there. Actually, Erik has posted some very lovely rural shots of southern Ontario OO country in the past. I was also thinking that this sign was too enticing for someone to resist…it’s amusing but it also looks like it could have contributed to safety. 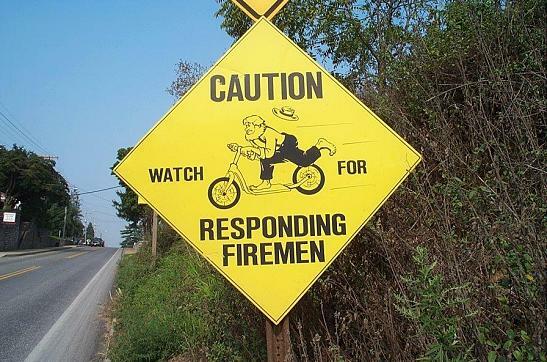 Come to think of it, you really don’t see scooter or bicycle warning signs in Amish areas, though it seems like they would make sense from a safety standpoint. Marilyn that is interesting about no buggy signs in that Old Order Mennonite area. I wonder how many families live there. Seems like they’d have something up. Maple syrup is a treat. And the good stuff isn’t cheap, is it? I remember seeing it quite a bit in Geauga County, Ohio, with Amish tapping trees and selling it. Not so much in Holmes County. I don’t know if you all saw it, but Karen Johnson-Weiner shared a couple of photos of an Amish maple syrup operation in New York. Shom good point you do get a lot of names overlapping. I did not know (or maybe forgot) there was an Aylmer in the US. Canada Amish tend to have a few specific names that are mainly seen in Ontario (Gascho comes to mind, I believe there are a couple others). Thanks for reminding me of those photos, I checked and maybe these are the ones you were talking about? Thanks Erik … did you see my reply to Katie? I do love this sign!! Especially love seeing the children riding along on those scooters. I also love seeing the parents and older siblings pulling the little ones on wagons. 🙂 I’ll look forward to the Maryland signs! I grew up not too far from Southern Maryland Amish country. In New York we have homemade Maple Syrup where I live. I think back to when I was a kid and we had maple trees in the school yard and use to put buckets up to catch the maple as it dripped from the trees. They still make here in our area. I didn’t ask her how many Old Mennonite live in her area, but there are quite a few of them. They don’t all live in one group. One lives one place then 3 or 4 farms down another one – on the next road another one. They don’t live far from each other, but not all together. In her area three Amish families have moved in and more are coming. She was very upset that there are no buggy signs in the area.